We’ve all seen those beautiful cakes – you know the ones I’m talking about – covered in retro polka dots or decorated with ribbons, chocolate collars and cigarellos… well, Katrien’s Cakes shows you exactly how to make these delicious trimmings, using all sorts of chocolate techniques. Yum! Katrien van Zyl manages to be comprehensive without being intimidating. She includes all the information you could ever need – from equipment lists to serving guides. 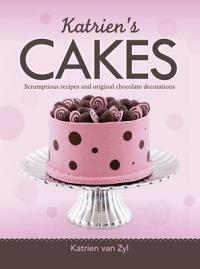 You’ll learn how to fill and coat cakes, as well as how to stack them, and most importantly, how to work with chocolate. There is one thing you do need to learn before beginning any of her projects – and that’s how to temper chocolate. I’ve been petrified to try it ever since watching a few Masterchef Australia contestants fail miserably at making chocolate collars. But Katrien really makes it look simple. Her instructions are clear and precise, accompanied by helpful photos, making her technique very easy to follow. I’ll definitely be giving her method a bash. The book includes 20 original decorating designs to copy. Each design is given a full-page photo of a cake decorated using the finished product. This is great because it shows you the overall effect. Her chocolate design instructions are accompanied by step-by-step photos, as well as a recipe for the cake mixture. Each cake-decorating project includes helpful tips and hints. Learn how to make chocolate flowers and roses; truffle towers; pleated, curved and lace collars; buttercream icing; chocolate ganache filling; chocolate paste and much more. All recipes include a star rating – one star for easy, two stars for in-between and three stars for difficult, so you can start at beginner level or jump right in at advanced level. If you’re a chocoholic like me, you’re going to have a hard time putting this book down. Whether you’re a skilled baker, or a cake-in-a-box extraordinaire, this book is perfect for adding that personal touch to your creations.